This product was produced in a facility that may also process ingredients containing milk, eggs, soybeans, shellfish, fish, tree nuts and wheat. Malic Acid, Xanthan Gum, Natural & Artificial Flavors, Citric Acid, Silicon Dioxide, Sucralose and Acesulfame Potassium. Natural Flavor, Sucralose, Silicon Dioxide, Xanthan Gum, and Acesulfame Potassium. Mix one (1) level scoop with 12 fl oz of water. Take before, during and/or after workouts and/or in between meals. Tastes awesome with ice! ALLERGEN WARNING: This product was produced in a facility that may also process ingredients containing milk, eggs, soybeans, shellfish, fish, tree nuts, and wheat. Yet another BCAA? Not even close. 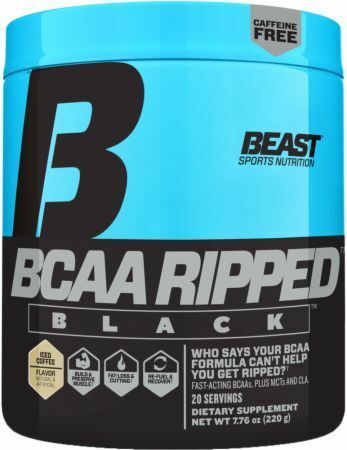 Beast Sports Nutrition's BCAA Ripped one adds FATS and is thicker than the others, making it real-deal delicious! This is the BCAA formula that helps you muscle up, get ripped, fuel epic workouts and recover. All with zero caffeine or other stimulants.BCAA Ripped Black gives you MCTs, a source of real, stable energy, to help you fly through the gym, CLA, to help your metabolism burn more fat, and zero caffeine, so you can take it whenever and however you want.